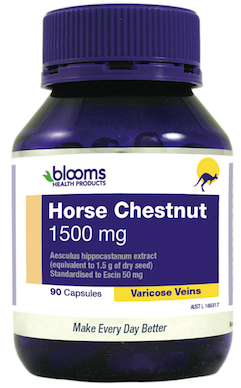 Horse Chestnut has long demonstrated impressive clinical results in the relief of symptoms associated with capillary fragility and poor venous tone. Escin, the most active constituent of Aesculus hippocastanum is responsible for such activity; it tones up the walls of the veins and improves the flow of blood back to the heart. It also relieves swelling by stopping excessive leakage through the walls of the capillaries. Horse Chestnut has the ability to decrease capillary permeability by reducing the number and size of the small pores of the capillary walls. This reduction in capillary fragility and oedema appears to be partly due to its normalising action on the metabolism of connective tissue. Investigators have also demonstrated escin has venotonic activity – the potential to increase venous tone by increasing the contractile action of the elastic fibres within the blood vessel wall (it is the relaxation of the blood vessel wall which greatly contributes to the development of varicose veins and other venous disorders). Aesculus hippocastanum (Horse Chestnut) extract. Although toxicity is rare, overdose of horse chestnut may lead to the symptoms of enlarged pupils, drowsiness and flushing of the skin. Possible theoretical interaction with blood thinning medicines and aspirin. Avoid using together.